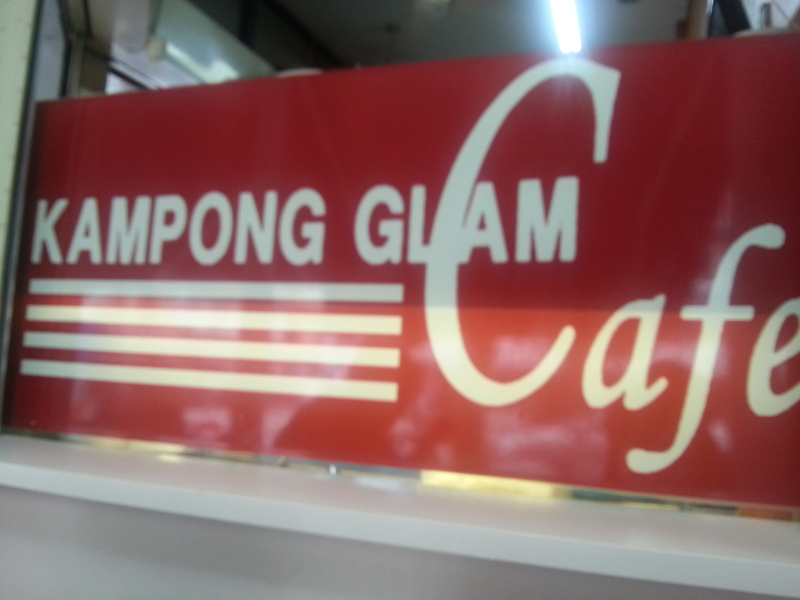 Two weeks ago, hubby and I went to Kampong Glam for lunch. 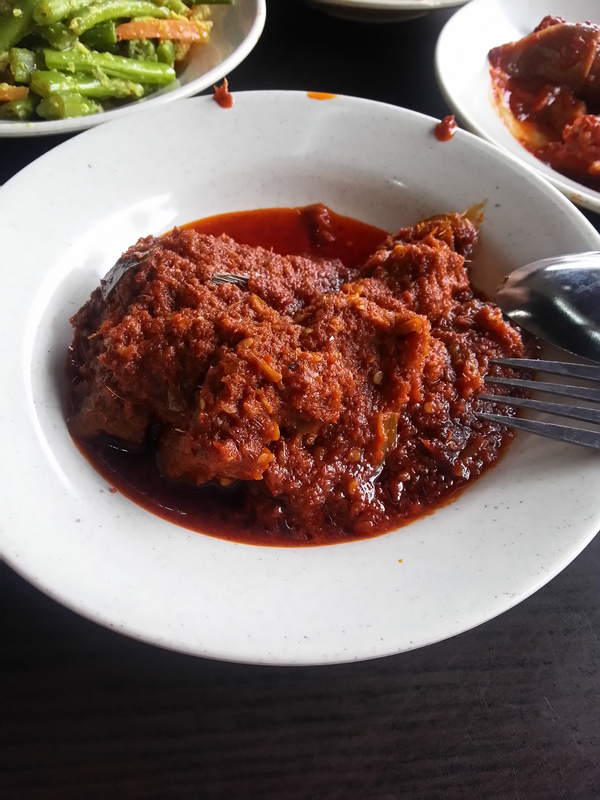 A TV programme recommended a restaurant selling nasi padang, dishes include beef rendang, curried fish, stewed greens, chili eggplant, curried beef liver, tripe, intestines, or foot tendons, fried beef lung, fried chicken, and of course, sambal. 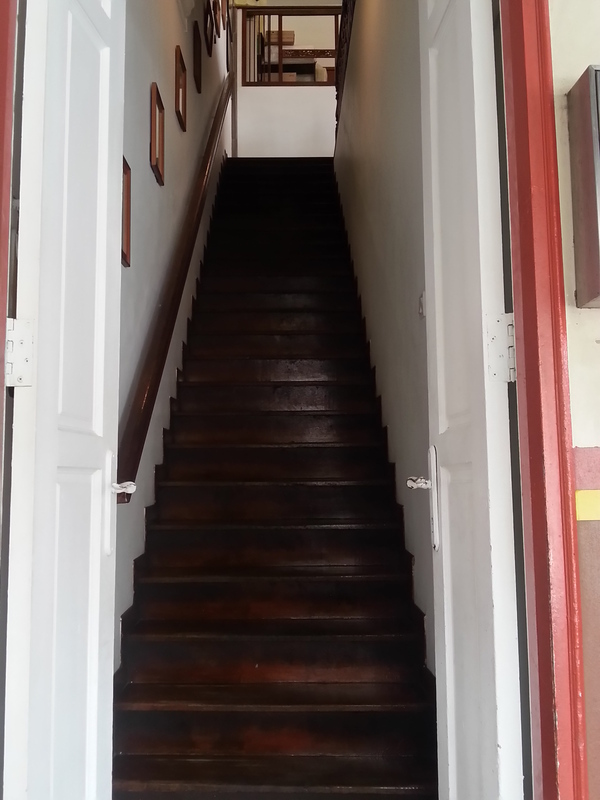 We took a walk around the area and found the actual restaurant that was featured on tv, Rumah Makan Minang, at Muscat Street. 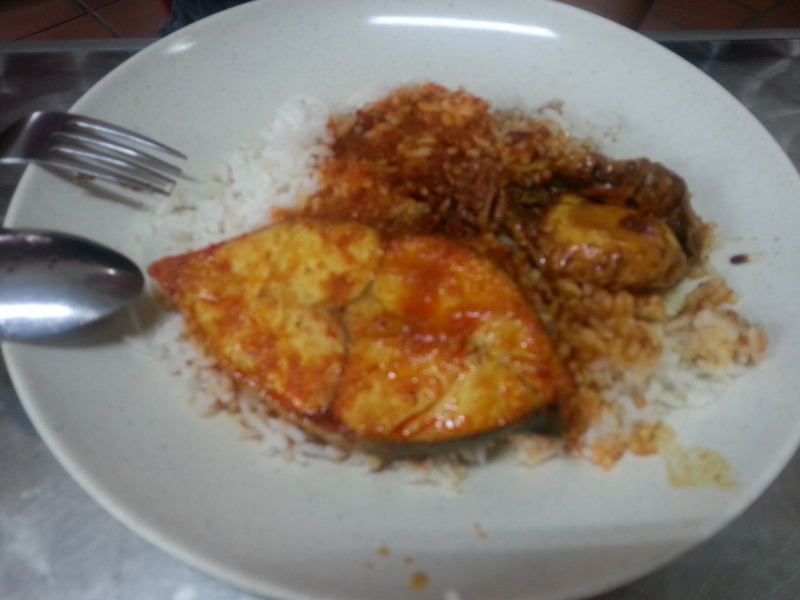 We went back again today to try their nasi padang. 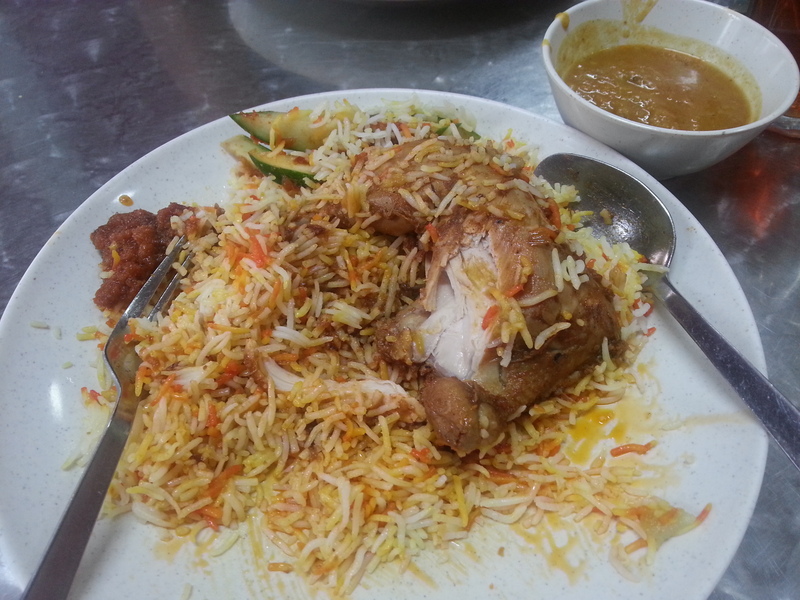 Hubby couldn’t wait… He started with the spicy chicken which he liked. We had long beans (not soft enough but it’s how the Malays would cook it), chili eggs (nothing special), sambal cuttlefish (sambal is very nice but cuttlefish is hard), rendang beef (lacks the sweetness that we’re used to in rendang dishes but very spicy and the beef not tender enough). 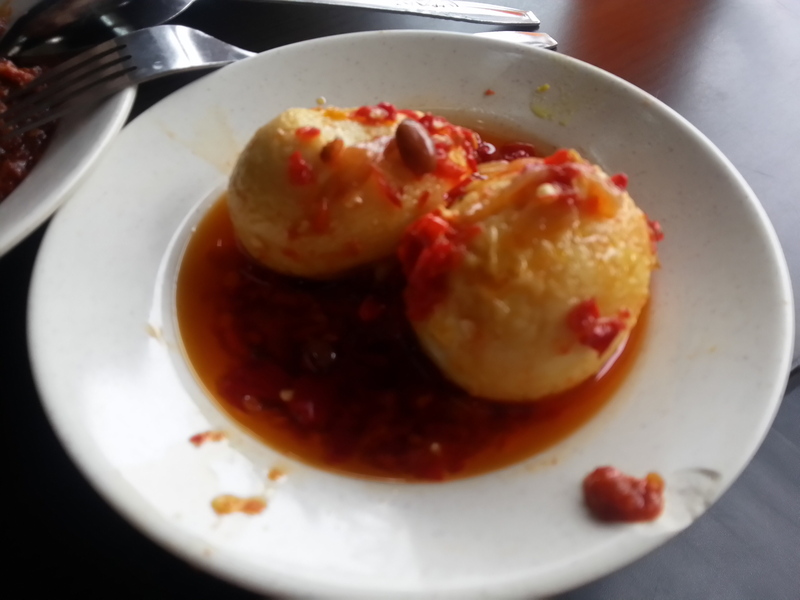 We were quite disappointed with the food but the snacks (kueh kueh) saved the day. The Ondeh Ondeh is a sticky, chewy ball made of sweet potatoes and have a filling of palm sugar which oozes out when you take a bite of the ball. 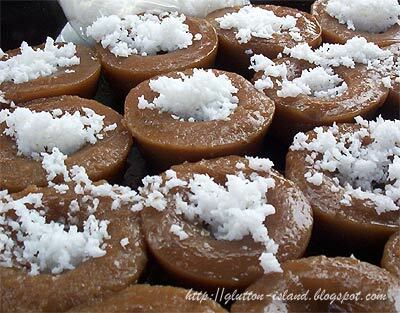 It is coated with grated coconut. 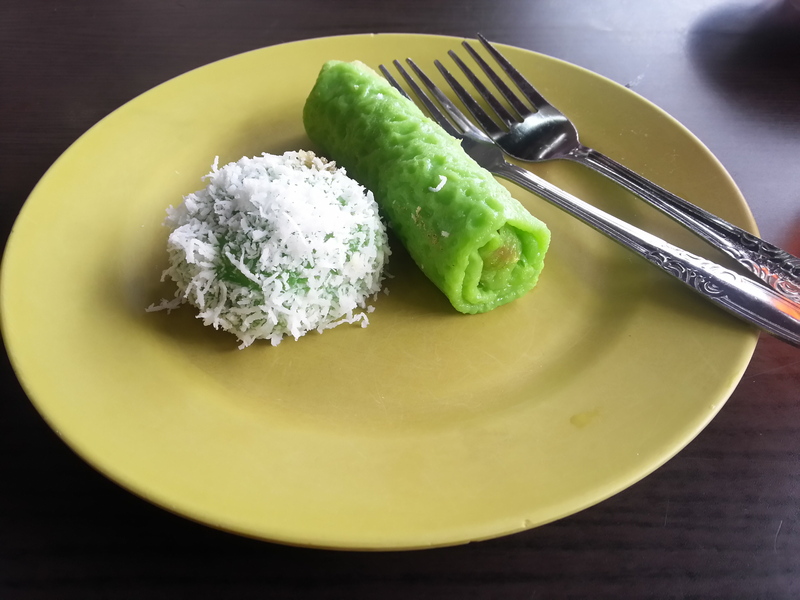 The Kueh Dadar, or coconut pancake, has a crepe-like skin which is sticky and slightly chewy, stuffed with shredded coconut stir fried with palm sugar. 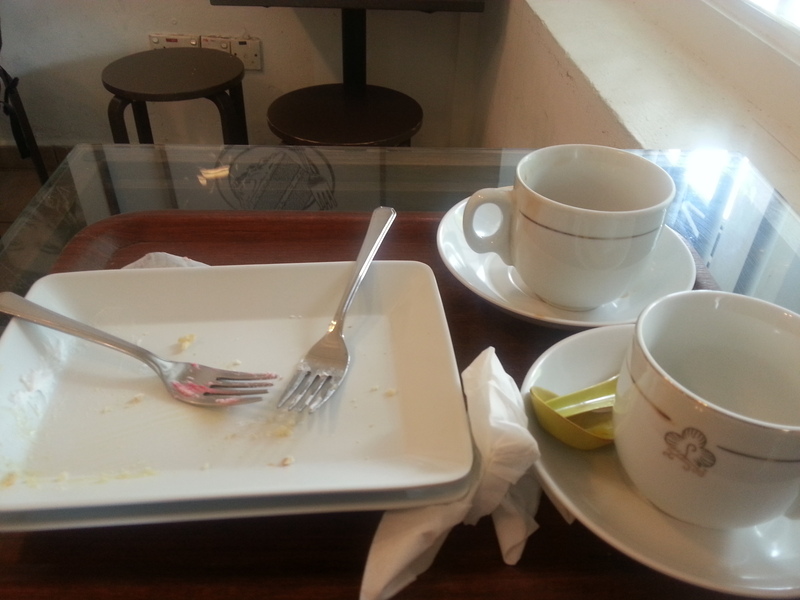 Both kueh kuehs are very nice, soft and suitably sweet. 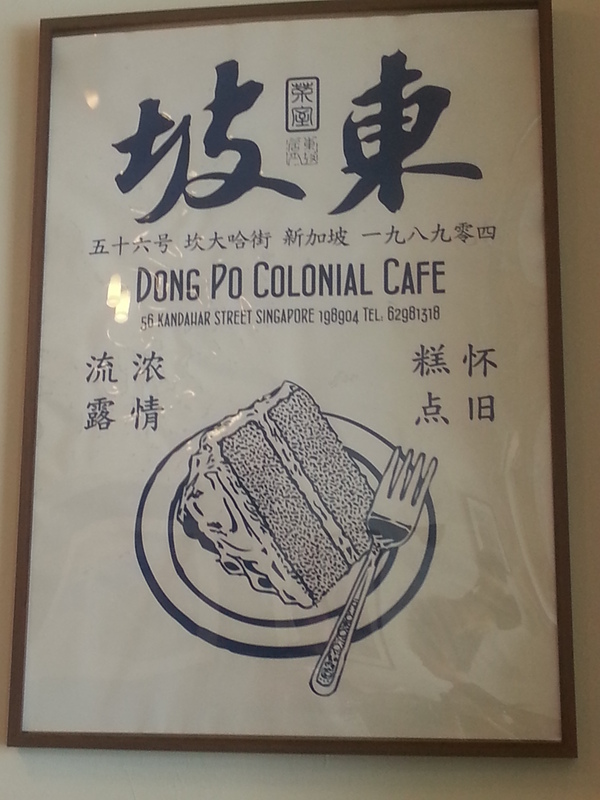 On the first day when we were at Kampong Glam, we had tea at this coffee shop called Dong Po Colonial Cafe. 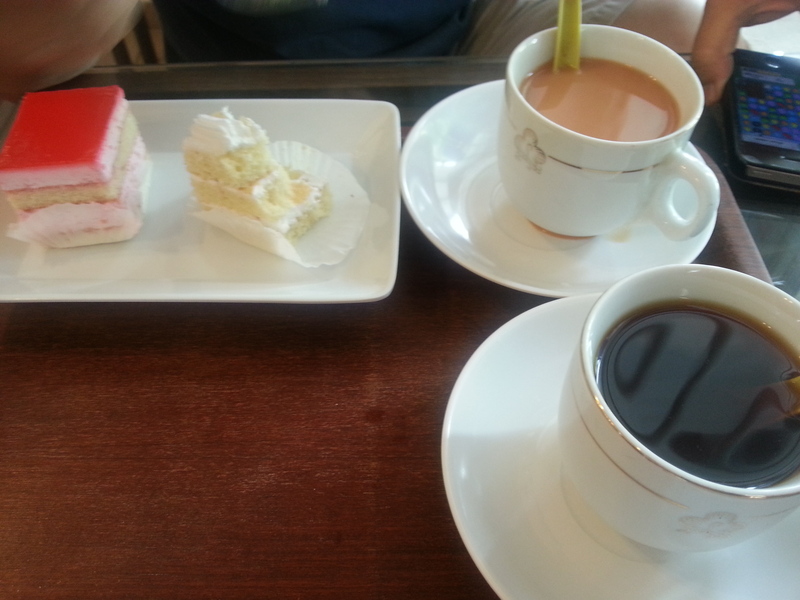 Although it said it sells traditional cakes and pastries, the truth is that the cakes are quite modern. I suppose the traditional stuff are the butter and kaya toasts and pineapple tarts. There was no butter cream cakes that we used to eat as kids. Instead, they are either fresh cream or mousse. 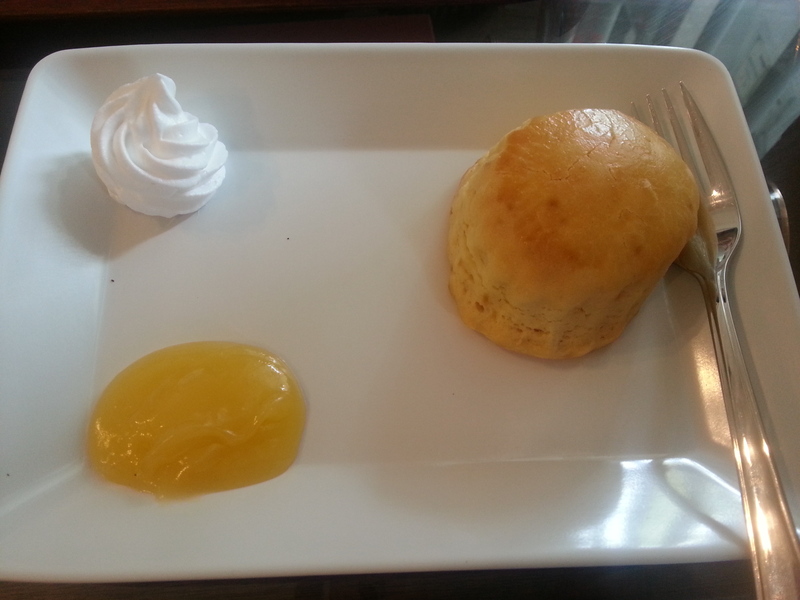 They even have English scone tea set. 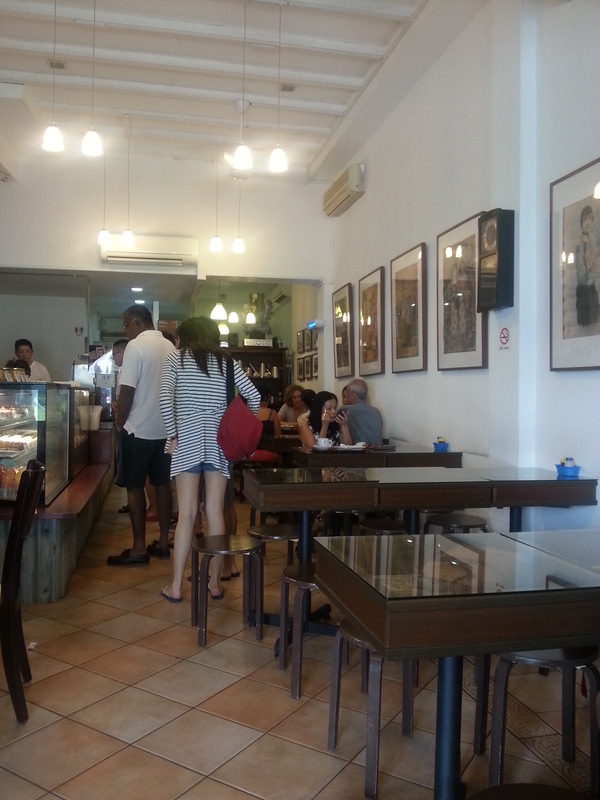 Nothing spectacular about the cakes or scone but the old-style decor lends a very laid back feel of the place which I like very much. 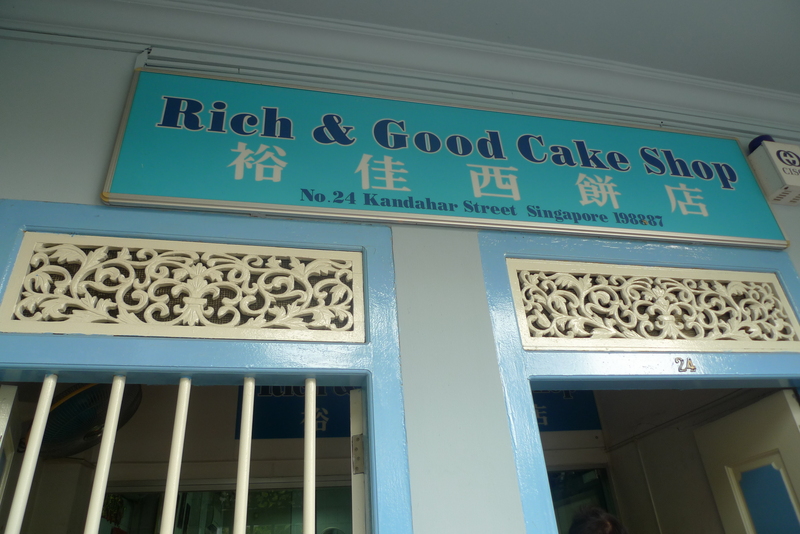 Here’s a shop along Muscat Street that sells swiss rolls that are all gone by afternoon, the Rich and Good Cake Shop. 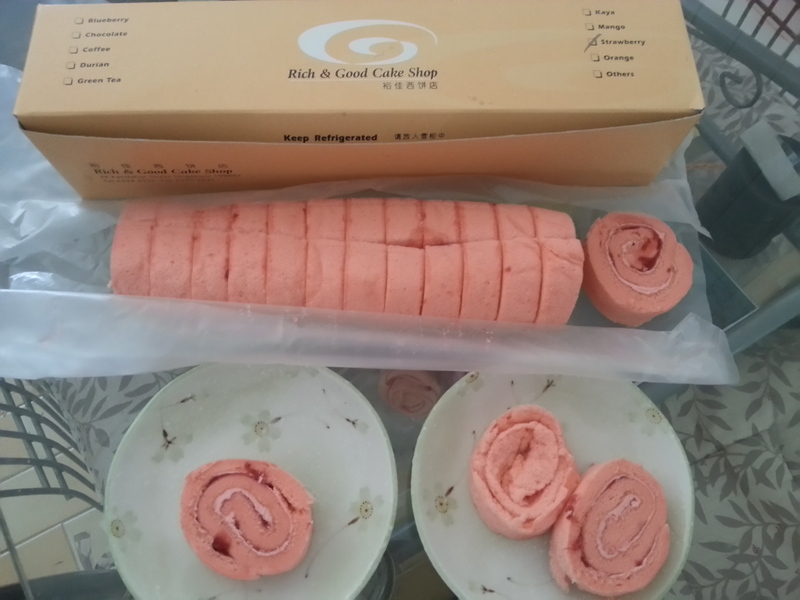 It’s a bakery that sells freshly baked swiss rolls, carrot cakes and walnut cakes. The first time we were there, we saw a long queue outside the shop. After finding out what the shop sells by asking one of the people in the queue, we thought we could come back later to try to get one of the swiss rolls but it was sold out by 3pm and the shop was closed for the day. 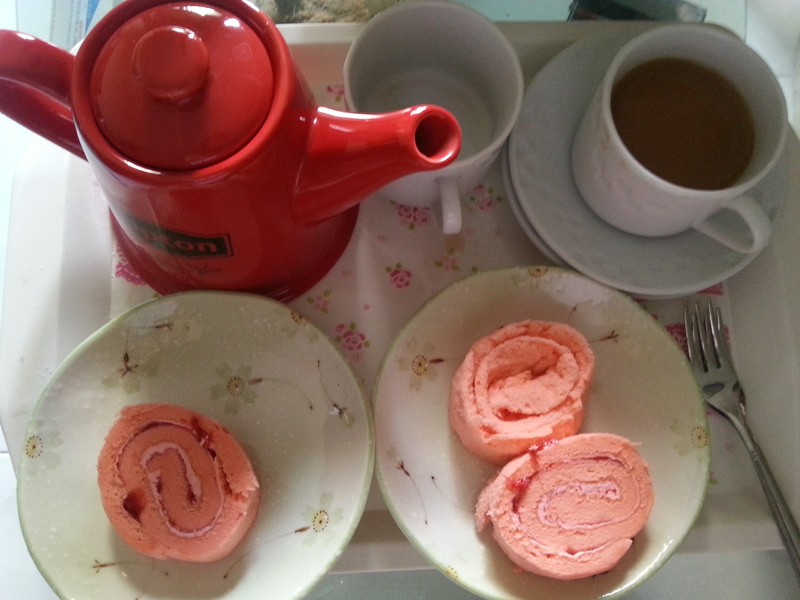 Today we managed to get one strawberry swiss roll. We had wanted the durian, mango or kaya (coconut and egg jam) swiss roll but they were all sold out, leaving us with just the strawberry, blueberry and fresh-from-the-oven chocolate swiss rolls to choose from. Business was good as usual and one aunty even stood next to the counter for 30 minutes just to wait for the chocolate swiss rolls. Most people would buy more than just 3 or 4 but it’s just me and hubby eating so we only bought one. 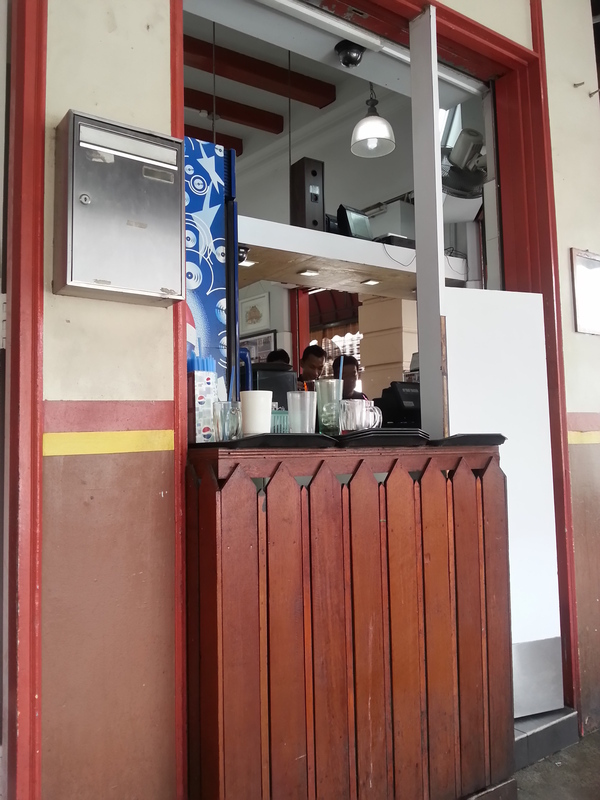 Despite the brisk business, the lady at the counter was polite and friendly. Might have to go back again to get the kaya one since hubby’s niece said it’s nice.